25' cord allows flexible placement options. Features 8 outlets, including widely spaced outlets that accommodate large transformer plugs without blocking the remaining outlets. Isolated filter banks help eliminate interference between connected equipment. Stay aware of potential power problems thanks to the diagnostic LED indicators. 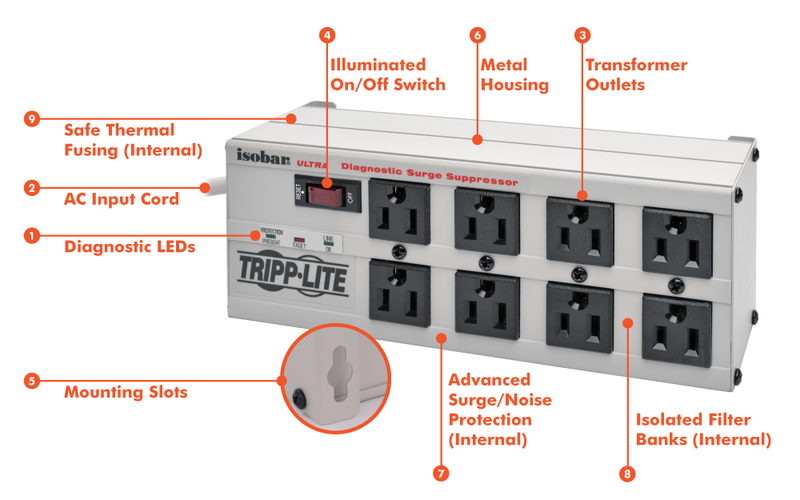 With independently verified surge-stopping power fully tested and certified to meet strict UL standards, this Tripp Lite Isobar® surge protector is the smart choice to protect your valuable equipment. Compared to other surge protectors, Isobar models have a substantially larger and more robust surge-blocking architecture. 3840-joule surge protection rating – More joules mean more protection! Compared to other surge protectors, Isobar models have a substantially larger and more robust surge-blocking and noise-filtering architecture.